Next time while you are in Shimla don’t forget to try ice skating which is considered as one of the favourite sport in Shimla. This place is already a hit among the people because of its cool weather. Now with this adventurous sport in Shimla this place is crowded with people every year. 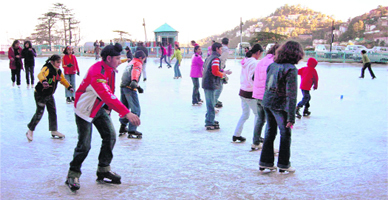 Ice skating in Shimla has already become popular among the people within a short period of time. The best thing about this place is that they have naturally frozen ice which is very convenient for ice skating. Enjoy the cool breeze as you glide through the ice under the clear blue sky.